Owning a home in Central Sarasota puts you right in the middle of everything this town has to offer. You are only minutes away from downtown Sarasota, the interstate and your choice of world class beaches including Siesta Key, Lido Key and Longboat Key. As you move east of Sarasota Bay, the affordability index rises without loosing any of the conveniences. If being close to everything Sarasota has to offer, homes in this area will be on your "must see" list. 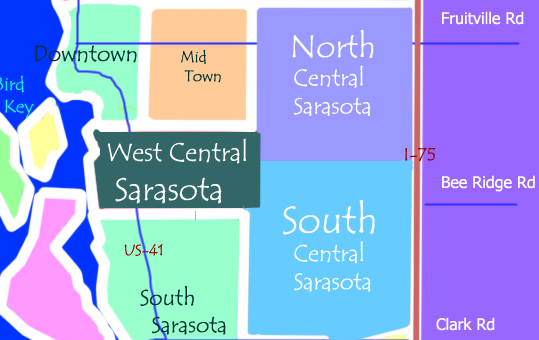 Central Sarasota is located south of the downtown area from the bay to I-75 between Bahia Vista Street and Bee Ridge. East of Beneva Road it runs from the 17th Street/Fruitville Road area to Clark Road. The most notable areas are Harbor Acres, The "West of Trail" area including the flower streets, Southgate, Forest Lakes, Sarasota Springs, Colonial Oaks, Country Place, Three Oaks, and Sherwood Forest. Upscale shopping can be found at Westfield Mall - Southgate and more traditional shopping is found on most of the major arteries. Central Sarasota is truly one of the best locations for residents of all kinds be they year-round or just the seasonable snow birds. This is not only a great place to start your Sarasota Real Estate search but also a great place to live. We are the local experts when it comes to finding and buying a home. We look forward to seeing you here...maybe on the beach!